“If healing is to make one whole, and love is a path to healing, then the healing energy of a loving friendship is a sacred act. This card is an indication to either give or receive the healing energy of love. 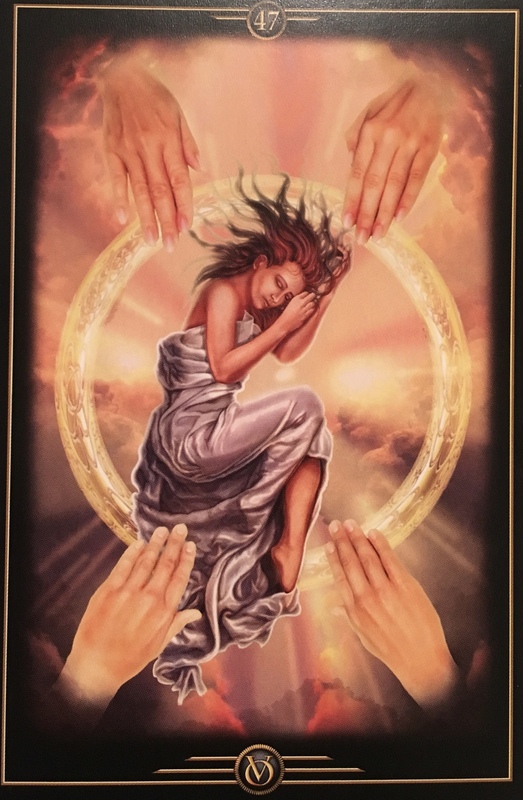 A women appears to rest or sleep in a circle of healing light. If we could see Reiki energy as though it were radiant light, it would perhaps look like this. The flawless circle suggests perfection and completeness. It is time to pay it forward. Be the one who does a kind and loving gesture for another. It could be a donation to a good cause, maybe a hamper item or a toy for a child; it could be holding the door open for someone laden down with bags; or it could be taking the time to call an elderly relative or visit them in a home. Whatever it is, it will be for them, not for you, and it will brighten their day and lift their spirits, which is exactly why it is so worth doing! Christmas is crazy! People are stealing each other’s parking spots, shoving others out of the way to get the toy of the year, trying to get their kid to the front of the line to get a photo with Santa and all sorts of other not so charitable things! It’s up to us to turn all that around! And it’s sooo easy to do! A smile, a kind word, time spent, having tea or a real conversation with an old friend, volunteering at a soup kitchen, wrapping gifts, attending a child’s concert… the options are endless. It is just a matter of taking the time and making the effort to see a priceless reward, with no expectations for payback. Karma is the best payback there is, and paying it forward means that someone else gets the gift that you offer. Win-win! Giving of ourselves is the easiest way to assist in raising the vibration of the planet. More joyful people means higher vibes! It’s so simple. When we put ourselves out there for the Highest Good, it is like the ripples on a pond… it truly is a gift that keeps on giving as we inspire others to give of themselves too. You have an unlimited amount of hugs, smiles and kind words to share. Get out there and share the love!